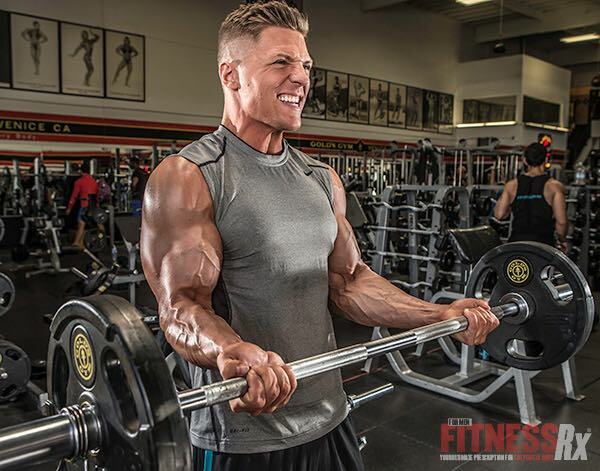 Big, defined arms are the first things most people notice about a well-developed physique. 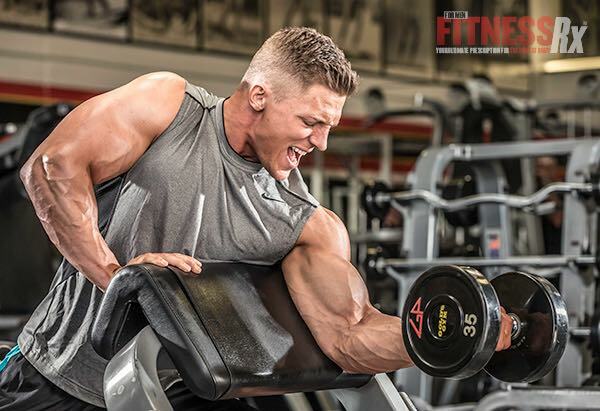 That’s why FitnessRx for Men examined the science behind what it really takes to get big guns. The results? Read on. Science suggests that the high-speed eccentric training is the way to go to produce rapid results. Fast eccentrics create more muscle tension, and negatives or eccentric muscle contractions create more muscle tension more than any other form of exercise. To build big guns, it’s essential to incorporate exercises that use concentric, eccentric and static muscle contractions in a training program, as this will result in the greatest training adaptation. Conventional weight-training moves like curls allow you to lower more weight than you can push while lifting. More muscle tension is created by contracting the muscle eccentrically (lowering the weight) than contracting them concentrically (pushing the weight). Since concentric exercises produce the greatest changes in concentric strength, and eccentric exercises produce the greatest changes in eccentric strength, the best and most effective weight-training program incorporates exercises that use concentric and eccentric muscle contractions, because this will cause the greatest training adaptation. Measurable changes in muscle sizes can take weeks. After weight training, muscle cells go into overdrive repairing the damage caused by weight training and make new proteins so that the muscle is strengthened and able to withstand additional stress. Muscle growth can take weeks because muscle size reflects the balance between making new protein and breaking down old protein. The breakdown of muscle is increased after a heavy workout, often exceeding the rate of protein synthesis. Catabolic hormones and anti-growth factors, such as myostatin, speed the rate of muscle breakdown following exercise. In order to build muscle, you want to speed the rate of muscle hypertrophy while slowing the rate of muscle breakdown. This is where fast-speed eccentrics comes into play. 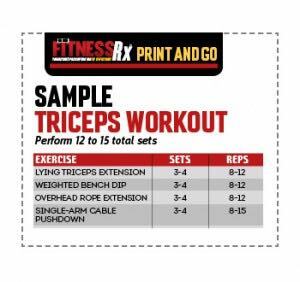 This type of training works because it produces high muscle tension during the workout. But it’s important to remember that rest and nutrition are also essential for growth. In order to get the most out of your arm training, an understanding of the difference between fast-twitch and slow-twitch fibers is important. Muscle fibers are defined as either fast-twitch or slow-twitch depending on their strength, speed of contraction and endurance. Slow-twitch fibers have good endurance, but are slow and weak, while fast-twitch fibers are able to contract rapidly and forcefully, but fatigue quickly. Your nervous system will select muscle fibers depending on the intensity and speed of the movement task. Small, low-force endurance movements will call on slow fibers (like jogging slowly) and fast fibers are needed for quick forceful movements (like high-intensity weight-training exercises). In weight training, the number of sets and reps in your program will determine which fiber types you use during training. Most studies on weight training have shown that the typical program that involves three sets of four to 10 reps will build mainly fast-twitch fibers. On the other hand, exercising while extremely tired or doing more than eight reps focuses on slow-twitch fibers. You can build both fast- and slow-twitch fibers by including both high-resistance (high muscle tension) and high-endurance sets in your training program. For maximum growth, it should be your goal to stress all motor units— and that means including high-intensity and high-rep sets. High-speed eccentric training is an effective way to encourage results, but as with all advanced training methods, it’s important to use caution in order to avoid injury. It’s best to progress slowly and start off with lighter weights, especially if you are a beginner. Limit high-speed eccentric training to once a week and be sure to include all elements in your program that will help promote muscle hypertrophy, include dietary protein timing and quantity, caloric intake, rest and avoid overtraining. Electromyography (EMG) is a tool used by scientists which measures the electrical activity of the muscles and shows how much the muscles work during specific exercises. Scientists record EMG by placing electrodes over a muscle belly, and the harder the muscle works, the greater the electricity measured on the EMG. Using EMG on key muscle groups, scientists can determine which exercises are best for activating muscles and building size, strength and definition. Using this knowledge, we created a workout with the 12 best lifts to get bigger and stronger arms. 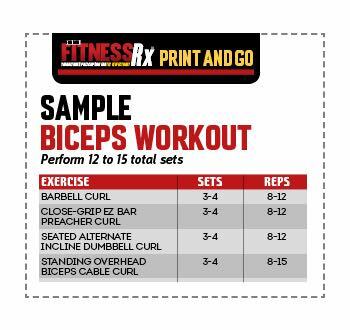 This workout will help you build muscle like you never have before as you maximize the release of anabolic hormone, such as testosterone, IGF-1 and growth hormone.